You wouldn’t use a hammer to tighten a screw and you wouldn’t use a platform trolley to ship stock to shops. Different tasks around the warehouse require different products to ensure maximum efficiency and safety, particularly if they’re being used on a daily basis. These are a real staple in any warehouse. Their design allows staff to transport items that are much heavier than they could carry. Unload deliveries, load lorries, shift boxes around…do it all with a sack truck. When it comes to filling the post van, sack trucks are pretty nifty at transporting sacks, too! What is its weight capacity? Make sure the sack truck you choose can handle the weights you’ll be loading it with. Is the toe plate big enough? The platform that your box or other item sits on needs to be large enough to support it properly. What are the wheels like? 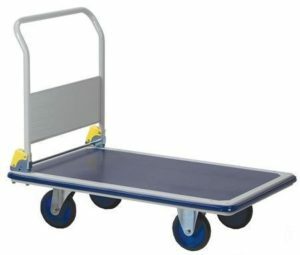 This is surprisingly easy to overlook but if you’ll be using the sack trolley on uneven terrain, need wheels that won’t mark the warehouse floor or have got any other specific requirements, check that the wheels are right for the job. Is it ergonomically designed? For example, nice, comfy handles will make lugging heavy boxes all day much less of a chore for staff. Has it got any safety features? Many sack trucks feature knuckle protectors which are a bonus extra and improve handling. Does it need to fold away for transport or storage? If you use a sack truck infrequently or want one to travel in a lorry for deliveries at the other end, think about one that folds away flat or has telescopic handles. Consider its weight, too. 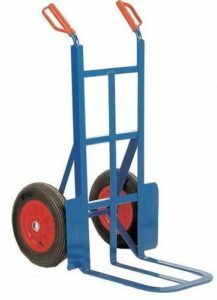 The 250kg Capacity Folding Toe Sack Truck with Solid Tyres is a fantastic staple sack truck for everyday use in your warehouse. It can shift heavy loads and wide items whilst featuring ergonomic handles and knuckle protectors. Alternatively, the 90kg Capacity Aluminium Sack Truck With Telescopic Handle is brilliant for packing neatly away in a lorry for moving lighter loads. These are two great options but we’ve got lots of other sack trucks to choose from. Why not browse the full sack truck department and get some ideas for yourself? These trolleys are simple but effective. They’re really useful in the warehouse for distributing stock for storage, taking it out to the lorry, unloading deliveries…any time that you want to move pretty much anything anywhere, really! What is its platform size and load capacity? Will it be able to cope with the size and weight of items you’re likely to load it up with? Is it manoeuvrable enough? Many platform trolleys have two fixed wheels and two that swivel to make the trolley easier to move around. If manoeuvrability is really important, consider a turntable truck as an easy-to-steer variation of a platform trolley. What is it made out of? Depending on what you’re transporting, you might want a platform that is anti-slip. Consider also if the frame needs to be corrosion resistant. Does it need to be compact? If you’re tight on space or won’t be using your platform trolley continuously, think about investing in one that packs down for efficient storage. Are there any bonus features? For example, some are fitted with buffer strips to protect doorways and walls. The Steel Platform Trolley comes in two sizes, offering different load capacities to suit your needs. Both sizes make fantastic all-rounders in terms of platform trolleys, each with a buffer strip and anti-slip PVC platform surface. The handle folds down flat for easy storage or to make it more convenient to pop in your lorry if needs be. If you want to explore for yourself, browse our full range of platform trolleys here. If you make picking products from your warehouse as safe, easy and efficient as possible, you will make the most of your employees’ time and ultimately need less staff to do the same amount of work. Can the picking trolley fit down the aisles in your warehouse? If it is too wide, it’s simply no good. Is it ergonomically designed? Think about handles and/or shelves that are high enough so staff don’t need to keep bending over. Does it offer enough surface space? The whole purpose of a picking trolley is to make picking easier. There needs to be enough room for staff to keep the items they pick. Is it durable? Make sure the picking trolley you choose is up to the conditions in your warehouse. Look at what it’s made out of and make sure the wheels will last without marking your floors. Would steps be useful? Having the option to take steps with you everywhere you go when picking can save a lot of time. Even if it’s simply to reach items that are only just out of reach, if it means that staff don’t need to wander off and find a step ladder or, worse still, feel tempted to climb the shelving itself, then you’ll save time and promote safe picking practise. The descriptively named Order Picking Trolleys With Ergonomic Handles make a great choice for the warehouse. 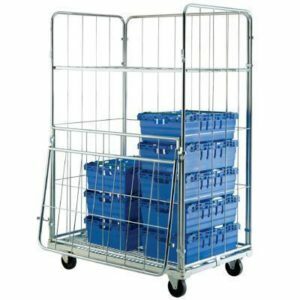 With two options of product offering two or three shelves depending on your requirements, these trolleys cover all the points raised above. Check them out and start imagining faster, safer and efficient picking from now on. These are perfect for loading up with stock at the warehouse to ship out to shops. They’ve usually got a large capacity, wheel around easily and can be simply secured in a lorry. What should you look for in a roll container? What is its volume and weight capacity? This one’s pretty simple – it needs to be able to handle the loads you’ll be using it for. Would shelves be useful? Many roll containers have the option of adding shelves. Think about what will be going into the container and whether shelving is a necessary extra purchase. Can it nest/fold away? You won’t necessarily use your roll containers all the time so ones that fold flat or nest away neatly are a real space-saving bonus. Can it be locked? If security is a concern, choose a roll container than can be locked with a padlock or cable tie. To start off your journey of roll container exploration, why not check out the 500kg Capacity Demountable Security Roll Container? It’s a great all-rounder with a high load capacity, a clasp fitting which can be locked and the option to pop a shelf in as well. If that’s whetted your appetite, browse our full selection of roll containers here. 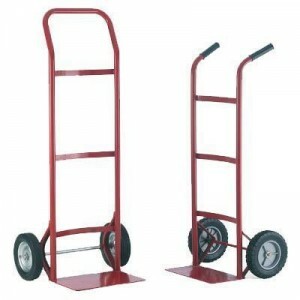 Ideally, you’ll have specific trucks and trolleys for different tasks around the warehouse. However, if you’re tight on space, your funding is stretched or you are a small business and don’t feel you need a full range of trucks and trolleys at this stage, there is an option that might be just right for you. Allow us to introduce you to the 250kg Capacity 3 Position Sack Truck Large Toe Plate. We like to think of it as the Transformer of the warehouse world! It is three useful trucks in one, easily changing from sack truck to trolley to platform truck depending on your needs at the time. It will never quite match up to the three separate trucks but is a fantastic alternative if it’s not feasible to have the whole range in your truck collection. Hopefully you’re now clued up on the differences between the trucks and trolleys a warehouse requires to function effectively. If you need any more advice or help choosing the right product for your business, get in touch with our sales team today on 0800 652 6000.